“I’m super happy for today’s victory in front of so many super strong rivals." Luis Leon Sanchez (Astana) confirmed the excellent condition he showed at the Volta Valenciana by coming out on top in the first battle in the mountains on the second day of the Volta ao Algarve. With a powerful surge in the final part of the uphill finish on Alto da Foia, he put 1 second into Geraint Thomas (Sky) and three seconds into Primoz Roglic (LottoNL-Jumbo) and Ion Izagirre (Movistar) which allowed him to win the stage and take the leader’s jersey on a day that saw Alberto Contador (Tinkoff) lose 24 seconds. “I’m super happy for today’s victory in front of so many super strong rivals,” said Luis Leon Sanchez before the podium ceremony. “I knew my condition was good but I didn’t know how I could perform on an uphill finish like this. When Thomas attacked I was looking at Contador, waiting for his response. The wind was so strong on our left but I had good legs. Then I decided to respond and I was able to overtake Thomas and win this difficult stage. “I want to thank all my teammates who really helped my today. Also, a special dedication is for my family who is doing many sacrifices with me so many days away from home… this win is a way to say thanks. “It was a very fast and very hard stage. Team Tinkoff imposed a strong pace. We started with two riders infected by a virus, and that affected us, but we tried to stay together in the end. [Paolo]Tiralongo did a great job to get in front at the top. "I think when you get the chance and you are comfortable and in a group like we have now at Astana, it gives you the confidence to keep working, doing things right, taking care. "It was very fast, very hard, with a 7-8-rider break in which Gazprom had no one and had to pull. Then Tinkoff kept the gap below two minutes. “Tomorrow there is the individual time trial where normally I’m quite good… let’s see what will happen. “I will try not to lose the advantage for my opponents. When Astana gives me an opportunity, I have to take it, I have to give all I can. I am very grateful to this team. "We know it's a time trial that can be decisive and which can be greatly influence y the wind, which is not bad for me. Let me try not to lose the advantage, do my best and we'll see how I go. Geraint Thomas boosted his chances of defending his Volta ao Algarve title by finishing second on a brutal second stage. Thomas was well protected on the 198.6km trek from Lagoa, and then let rip on the Alto da Fóia as the main contenders worked their way to the fore. The Welshman battled all the way to the summit of the first-category climb, ending the day just one second behind the triumphant Luis Leon Sanchez (Astana). Those results mean Thomas now trails Sanchez by five seconds at the top of the overall standings, with the opportunity to make time back on the Spaniard in Friday's 18km time trial. LottoNL-Jumbo rider Primoz Roglic meanwhile, sits four seconds further back in third place after taking the same position on the stage. The hardest day of this year's race featured four categorised climbs in the last 60km and seven riders forged ahead before the road ramped upwards. As Tinkoff began to keep the breakaway in check, Team Sky were dealt a blow when David Lopez was forced to abandon after crashing shortly before the second intermediate sprint. The race came back together with 30km to go, and once Dries Devenyns' (IAM Cycling) solo attack had been snuffed out, four riders moved clear as they began the final, toughest climb of the day. High winds and a determined chase saw them brought back into the fold 2km from the summit, and by then Thomas had ridden his way firmly into contention. Although the 29 year old couldn't repeat his stage success of last season, he is now brilliantly positioned heading into Friday's potentially-pivotal race against the clock. After the race the Team Sky website caught up with Doctor Richard Usher to give us the lowdown on the day's crashes. He told them: "Salvatore and G's crash wasn't too serious - they had a few cuts and grazes, but nothing more than that. Unfortunately David wasn't as lucky. He went down as he exited a roundabout and fractured his left collarbone. "He went straight to hospital and X-rays confirmed the injury. He'll travel home now and see a specialist in the next few days to ensure he gets the best possible care." Sports Director Gabriel Rasch was sorry to see Lopez withdraw from the race, but praised his riders' efforts on the hardest stage of the Tour. He said: "Michal [Golas] and Ian [Stannard] did a really good job in the last hour of action and then Salva [Puccio] was super strong on the penultimate climb. He suffered more bad luck though by picking up two flat tyres with around 10km to go, and that meant G was alone on the last ascent. "He stayed calm when the small group went up the road, and then did a good job at the end there. "He's in a good position now and will try to take the jersey tomorrow, but Sanchez is a great time triallist, so we know it won't be easy. "It's an 18km course with a technical first 4km. Then we head out onto the coast road and wind could well play a factor there. G's in good form though and he's motivated to defend his title." LottoNL-Jumbo’s Primoz Roglic followed the strongest riders on the final Alto da Foia climb and placed third in the second stage of the Volta ao Algarve. When his aggressive team-mate Robert Gesink was caught with one kilometre to go, Roglic fought to finish third. 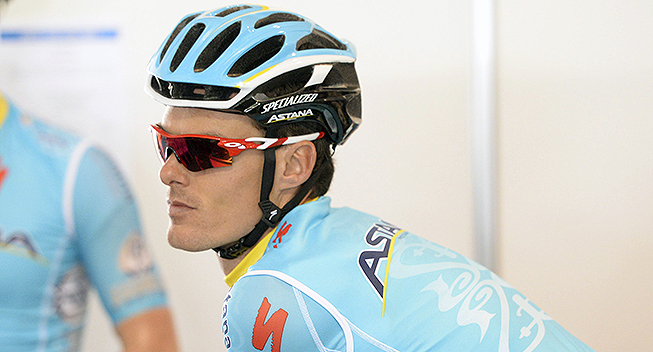 Luis Leon Sanchez (Astana) won. Until that moment, Primoz Roglic was in front of the chasing group. It was his job to mark the others to allow Gesink space. He showed he was able to follow the top riders until the finish line. Roglic’s performance is one in a cluster of strong performances for Team LottoNL-Jumbo’s new riders and that gives Zeeman a good feeling. Ion Izagirre (Movistar Team) continues to perform well in the early season, with results still not matching his performances. The Ormaiztegi-born cyclist was one of the most active riders in the finale of stage two in the Volta ao Algarve. 199km with a lumpy four climbs in the second half of the route, plus a mountaintop finish in Fóia (Cat-1)-, which the group directed by José Luis Jaimerena animated for good and wrong reasons. After a crash with no injuries in the beginning of the stage for Andrey Amador, three from the Blues made it through the first major selection created by the Alto da Pomba (Cat-2): Ion Izagirre, who crossed the summit in 1st place, Nelson Oliveira and Jonathan Castroviejo. The latter suffered a crash on the descent, with bruises in his knee and hip as a result, and was left behind by the leaders, yet he could finish the stage. To make up for his absence, Oliveira attacked with Stybar (EQS), Gesink (TLJ) and Rosa (AST) in a surprise move before the foot the Fóia ascent; the attempt was caught with just over 1km to go. Izagirre attacked strong in the later phase, but was left out of energy for the sprint as Sánchez (AST, 1st and new GC leader), Thomas (SKY, 2nd) and Roglic (TLJ, 3rd) went past. The new overall standings see the former Spanish road champion jumping into 4th, 13” down on Sánchez, with two stages on Friday and Sunday still to decide the final outcome. A 18km individual time trial in Sagres, around the Cabo Sao Vicente, will follow next. The final climb was an early season test for the peloton of 189 on Thursday’s stage 2 in the 42nd Volta ao Algarve, with Team Katusha’s Tiago Machado eager to try his luck. He missed only five seconds to be with the winner Luis León Sánchez (Team Astana), and took fifth place on the stage. Machado will look to upcoming days to make up the gap. “We had orders from (director) José to follow Contador and Aru and that’s what we did. In the last km several guys attacked and I was waiting for Alberto to attack, but maybe he didn’t have good legs today. By the time I started to follow the guys, I didn’t have time to close the gap and catch them. But there is still the time trial coming up and the finish in Malhão on Sunday is my lucky finish here. Maybe I can move up on the GC then. I only miss a few seconds, but seconds here are like minutes in big tours. Certainly, it could be worse, but let’s see how things looks after tomorrow’s TT. I do feel like I have good legs,” said Tiago Machado. Sánchez posted up a winning time of 5:08.25 on the 198,6km climbing stage from Lagoa to Alto da Fóia, just beating Sky’s Geraint Thomas by one-second. Third place at 3-seconds belonged to Primož Roglič of Team LottoNL-Jumbo. Ilnur Zakarin finished in the group of Fabio Aru, 15 seconds behind. Today’s results ended up re-shuffling the classification to see Sánchez in the yellow leader’s jersey by 5- and nine-seconds to Thomas and Roglič. Tiago Machado is fifth at fifteen seconds. Not part of today’s action was teammate Joaquim Rodríquez who had to abandon after 191 km of racing. Feeling sick the past few days, Purito was hoping his condition was improving but this proved to not be the case on stage two. “It hurts me to abandon but I felt bad all day and consequently had no power in the legs. To go on in these circumstances would harm me more than bring anything beneficial to me,” said Rodríquez. This stage was ideal to check the status of his teammates and their spirit and the signs of the early season were very encouraging. The distance, a nervous peloton, the crosswind for 100 kilometers and a summit finish challenged them and sports director Yvon Madiot is pleased. "It was very nervous but the guys, including an imperial William Bonnet, made ​​a great stage. All day they positioned Thibaut in the first twenty places in the peloton. There were crashes but we were not involved "
On the climbs before the final ascent, the peloton split and finally Sébastien Reichenbach was a perfect lieutenant for his leader. ”It was very hard all day,” Pinot told L’Equipe. “There was some crosswind and risk of echelons for almost 120 km. You always had to find a new position. In these cases, a lot of energy is spent. The finale was a bit like in the Basque Country: left, right, leftm right, small roads. “We rode the final climb like a train. Katusha first set a good pace, then Sébastien Reichenbach took ​​a big turn before the last kilometer. And in the end Geraint Thomas used his power on a fairly rolling part with the cross wind. He put everyone in the hurt zone. ”I'm still pretty happy. At the bottom, I did not have a good feeling, I was afraid to get dropped. It was my first race day of the year of more than five hours on the bike. It was long and I was afraid not to go the distance. I limited the damage and I am reassured. With more racing, I would have done better. I have not had good weather conditions in training last week and I feel it here. In the end, I was dropped because I'm have tired muscles. Today it was decided with the legs and no one could hide. Caja Rural - Seguros RGA had a very good day in Volta ao Algarve as Héctor Saez climbed with the best riders and finished 8th on the uphill finish on Alto da Fóia. Luis León Sanchez (Astana) won the stage and leads the race overall. Saez is 8th in the GC, which means that he now leads the youth classification and will wear the white jersey in Friday’s time trial. Ricardo Vilela and Eduard Prades did very well on the final climb as well finishing 19th and 23rd on the stage. Due to today’s strong performances, Caja Rural - Seguros RGA tops the overall team classification, five seconds ahead of Astana. “This was a very hard stage. The technical descent before the final climb made it a very difficult run-in. This is usually not my kind of terrain, I’m more of a ‘rouleur’, but it worked out very well today. Tomorrow, I hope to do a good result in the time trial and defend the team’s colors”. Known as a rider for the cobbled classics, Tiesj Benoot was a surprise 10th. "I was by far the heaviest rider of the front group. But I was very fresh today and I can always find something more in that kind of weather,” he told Het Nieuwsblad. "Today I worked hard in view of the classics. Tomorrow I'm going to give everything in the time trial. I knew already from Mallorca that I was in shape. Today it is once again shown that the condition is good. This gives us confidence for the Omloop Het Nieuwsblad. I'll be good next Saturday. But the competition will be hard. I saw Zdenek Stybar, Tom Boonen and Fabian Cancellara today and they were there for a long time on the climbsl. They will also be there. " Stage 2 of the Volta ao Algarve (Lagos – Alto da Foia, 198.6 km) began with Marcel Kittel in the yellow jersey and with Etixx – Quick-Step at the helm of things, and continued with a breakaway which had its fair share of time in the spotlight, until the last 30 kilometers: Alberto Cecchin (Team Roth), Sean De Bie (Lotto-Soudal), Jonas Koch (Verva-ActiveJet), Jonathan Lastra (Caja Rural), Ricardo Mestre (W 52-Porto), Oliver Naesen (IAM Cycling) and Gregory Rast (Trek-Segrafredo). It was an eventful day, which recorded ten abandons, as well as many attacks, especially in the last hour. One of these moments came inside the final 15 kilometers, ahead of Alto da Foia, when Zdenek Stybar accelerated on the downhill, before surging up Alto da Foia, where he was quickly followed by three other riders: Robert Gesink (LottoNl-Jumbo), Diego Rosa (Astana) and Nelson Oliveira(Movistar). The group worked together and at one point had 15 seconds over the chasers, but got caught as the flamme rouge was looming on the horizon. With 500 meters left, Luis Leon Sanchez (Astana) made his move and took the victory, ahead of Geraint Thomas (Sky) and Primoz Roglic (LottoNL-Jumbo). "I didn't feel too good today, the legs weren't super, but I still managed to defend pretty well on the climb. Now I'm happy and optimistic about tomorrow. I will give it my best and at the end of the time trial we'll see where I stand in the general classification." One of the few riders to try his luck before the last climb of the stage, Zdenek Stybar eventually got caught by the peloton, but managed to come home in the top 20 and make a significant jump in the standings. Before going to the team bus and leaving for the hotel, the Czech rider explained what happened in those final kilometers and what was his tactic for stage 2. "I knew the downhill from last year, so that's why I decided to go there, immediately after Diego Rosa made his move. I said I have nothing to lose, because if you don't try, you never win. So I attacked, found my rhythm and rode like this. Then Gesink came with two other guys, including Rosa, and we rode at a good pace, but the bunch caught up with one kilometer to go and in the last 500 meters it was too tough for me. In the end, I can consider myself satisfied, considering the quality of the field in Algarve and also that today's strong wind", Stybar said. André Cardoso was Cannondale’s top finisher at 20" behind stage winner Luis Leon Sanchez (AST). "My result does not describe all the work done, work done all together as a team, as a family. The only negative today was not finishing in the top ten,” he said. “I have the legs for that. We have a leader, Rigo, who gives us great confidence and a road captain, Sebastian Langeveld, who gives us tranquility and fantastic race reading." Tinkoff led a good part of a very tough and windy stage, bringing Contador in the lead at the penultimate climb. The huge and prolonged effort took its toll on the Spanish champion who feels his condition improving, ahead of the season's big goals. Racing got off in full earnest and things got serious at the Volta ao Algarve, with the longest stage, starting from Lagoa and finishing atop Alto da Foia. The peloton faced a complicated route, 198.6 kilometers long with four mountain climbs in the last 60 kilometers and a final 7km climb. The stage was marked by strong crosswinds, giving the peloton a hard time. Well into 100 kilometers, Tinkoff took the lead and imposed its pace on the race, which became more intense until the first climb. Right from the onset, a 7-rider breakaway was formed and Tinkoff played an important role in chasing it. It was eventually brought back, one by one, as kilometers went by, and the peloton was finally reunited back together with 40 km to go. “Today the team worked hard to put Alberto in a good position", stated sport director Steven de Jongh. “It was a very tough day with a lot of wind of course, and in the finale Alberto was not super. The result was not what we hoped for, and he was a bit isolated because some riders left him a bit earlier than we planned. It wasn't a top day but some of our riders did their work really well, that was good work. Tomorrow, we have a time trial and Alberto wants to have a good race. We will see how it goes." “I think Alberto was going well", added sport director Sean Yates, "but he took too much wind. It was a long day, a very windy day and he tried his way until the final climb but in the end the strongest man won and he was excluded. We had hoped for better." “In the penultimate climb, I tried to make the race a bit harder because the group was quite big but it was difficult to break the race with so much wind. There are riders with better legs here because they already have races under their belts. However, the Volta ao Algarve serves as a preparation towards Paris-Nice, where my goal is to have a good result. The sensations I have are what I expected. The work we carried out in Tenerife focused on building force and what I lack is race rhythm. That's precisely what I'm here for". "Tomorrow, we will tackle a time-trial and although it will be long and flat, it will be a very useful training towards my upcoming objectives," concluded Alberto Contador. An 18k-long individual time trial around Sages, is scheduled for tomorrow, and will very likely bring changes to the GC. Megias finished as Team Novo Nordisk’s best-placed rider at 35th, 4:43 behind Sanchez.